With more and more of our clients showing and viewing gardens for charity under the National Gardens Scheme, we recognise the importance of the National Garden Scheme to the gardening community and the fantastic contribution it makes by donating around £3 million each year to nursing charities. Griffin Glasshouses has designed a stunning collection of National Garden Scheme inspired greenhouses. Beautifully designed, the National Garden Scheme greenhouses are perfect for keen gardeners. For each one sold, Griffin Glasshouses generously donates 5% to the National Garden Scheme. The National Garden Scheme collection includes 8 designs, and each one has attractive proportions and a traditional interior with hidden fixings, reproducing the appearance of a traditional wooden greenhouse. 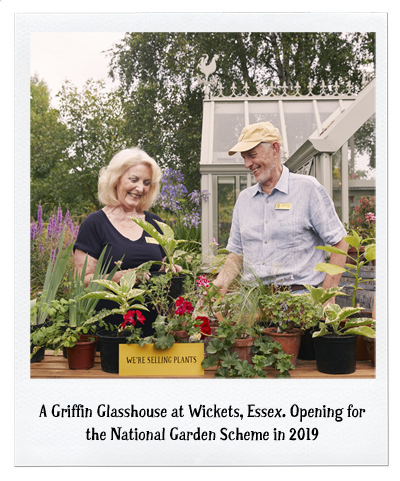 You can see a Griffin Glasshouse in many of our National Garden Scheme gardens including: Bere Mill, Hampshire, Blewbury Gardens, Oxfordshire, Shoemakers Cottage, Warwickshire, Allington Grange, Wiltshire, and Southwood Lodge, London. You can also see the Rosemary greenhouse from the National Garden Scheme collection in Wickets, Essex, Serendi, Hertfordshire and Heathside, Surrey (pictured above). Griffin Glasshouses also installed the glasshouse at the new Horatio’s Garden at Stoke Mandeville which opened in September 2018, and will be installing another at the Gobowen Horatio’s Garden in 2019. 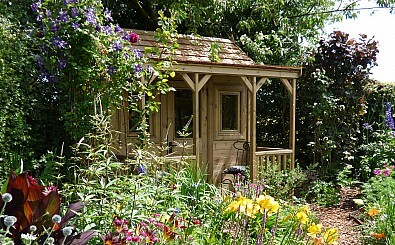 The National Garden Scheme shed has been designed with the serious gardener in mind.